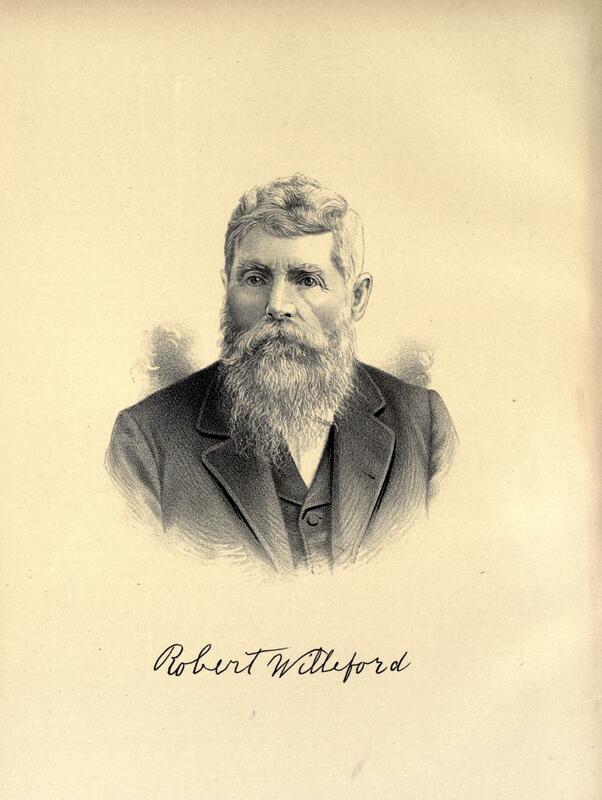 ROBERT WILLEFORD, a pioneer settler and honored resident of Ripley Township, Bond County, is also a veteran of the Mexican War, and a citizen of undoubted courage and integrity. Born in Rutherford County, Tenn., June 6, 1818, he was but nine years of age when he came to Illinois with his family and found a permanent home within its boundaries. Locating upon the broad prairie, about seven miles west of Greenville, he has for almost sixty-five continuous years been closely identified with every marked improvement and growing enterprise of the immediate neighborhood. As a County Commissioner he served with faithful ability three terms, his energetic efforts in behalf of public interests winning him the confidence and esteem of his official associates and the community at large. The immediate ancestors of our subject were Virginians by birth, both his father and paternal grandfather having been born in the Old Dominion. Jordan Willeford, the grandfather, at the early age of sixteen enlisted as a soldier in the Revolutionary War, and fought nobly for God and liberty. Afterward returning to his birthplace, Hampton County, he married, settled upon a Virginia plantation and became a slave-holder. His son James, born in Hampton County in 1791, was the father of our subject. Grandfather Willeford early removed to Tennessee, and there died at the advanced age of ninety-six years. He was a man of fine presence, energetic and fearless, and lived to witness almost a century's progress of our nation. Robert Willeford was the eldest child born to James and Sally (Price) Willeford. The mother was a native of Virginia, and died in Tennessee in 1826, leaving to her husband's care four little children, the youngest scarcely more than a babe. Some time after his first wife's death, James Willeford married Nancy Price, the sister of his former wife. The children of the first marriage were: our subject, Robert; Elizabeth, who married Aquilla Sugg, and died in October, 1883; Nancy Ellen, the widow of William Turner, who resides five miles east of Old Ripley; and James, who was born in 1825 and died April 12, 1880. By his second marriage, James Willeford became the father of four children, three of whom died young, the only survivor being Willis Willeford, a wealthy citizen and retired farmer of Ripley Township. The death of James Willeford occurred in 1862, upon the Illinois farm, where he had located thirty-five years before. He had never acquired wealth, and could give his children but the limited advantages of the early subscription and little district schools, but he trained them in the habits of industry and self, reliance, which fitted them for the battle of life. In common with the sons of other pioneers, our subject began hard work in early life, and while engaged in regular farming duties, the years went swiftly by, until in 1846 he enlisted in the service of the United States, and for one year, with gallant bravely, fought upon the fields of Vera Cruz and Cerro Gordo. Having returned to his home, he married, July 2, 1848, Miss Malinda, a daughter of Daniel File, who came to Bond County from North Carolina in 1818. Mrs. Willeford died in 1852, on the farm where her husband had located immediately following their marriage, and where he has lived ever since. Robert Willeford has been a life-long Democrat, and still takes an active interest in the conduct of public affairs. He is a prominent member of the Baptist Church, and has materially aided in extending its religious work. Hon. Edward L. Willeford, one of the prominent agriculturists and stock-raisers of the State, and the only child of our subject, was born October 7, 1850, on the homestead where he now resides. He received a primary education in the public schools and completed his course of study in a private academy at Greenville. At eighteen years he taught school, continuing in that occupation for a time, but soon permanently engaged in the business of his life general agriculture and stock-raising. Mr. Willeford and his father own about six hundred acres of valuable land, and have the finest herd of thoroughbred short-horn cattle in the county. At the early age of nineteen years Edward L. Willeford and Miss Lucy S. Davenport were united in marriage. Mrs. Willeford is a native of Montgomery County, and a daughter of very early settlers in the State. Mr. and Mrs. Willeford are the parents of six children. Francis M. is the wife of James A. Tabor, a farmer of Ray County, near Richmond, Mo. ; Ella Gordon is a teacher in the public school; Maud married Frank Barker, and resides in old Ripley. Robert L., Effie and Blanche are at home. Ella and Robert completed their education in Greenville, and the other children have profited by the now excellent public schools. In 1888, Mr. Willeford was elected by the Democrats to the State Legislature, and evinced so much ability in the discharge of his official duties that he was placed on several important committees. Mr. Willeford is a prominent member of the Independent Order of Odd Fellows, and is a genial gentleman, possessing hosts of friends. 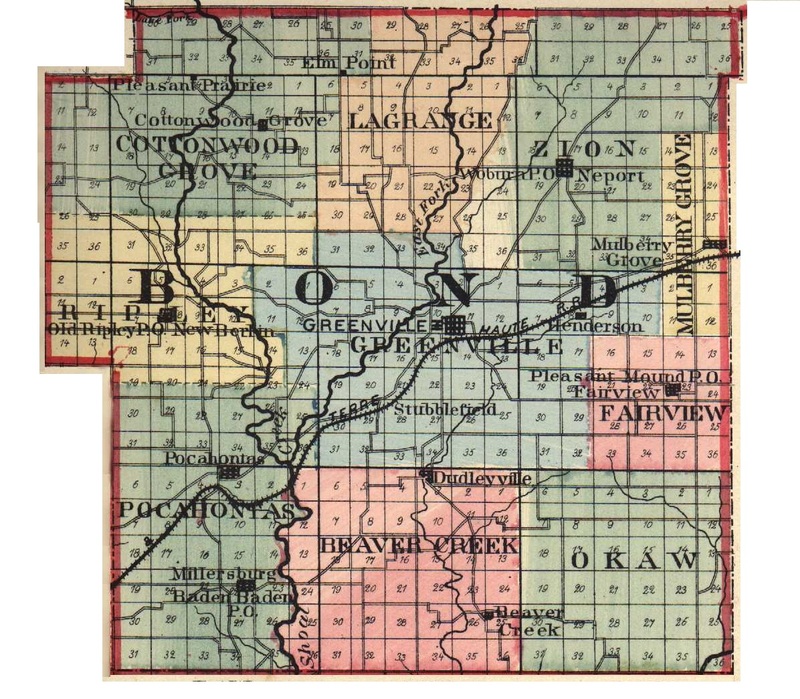 He is an important factor in the progressive interests of the county, and was one of the leaders in the establishment of the Farmers' Central Township Mutual Insurance Company of Bond County, of which he is the efficient Secretary. Extracted 04 Dec 2016 by Norma Hass from 1892 Portrait and Biographical Record of Montgomery and Bond Counties, Illinois, pages 198-200.